Approximately three weeks ago, I undertook an experiment. 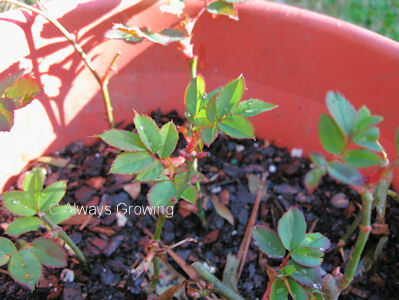 As I was cutting back my roses, I decided to try and root some of the clippings. My mother, who can root just about anything, has rooted roses several times, but I have only been successful once, and that time it was strictly by accident. 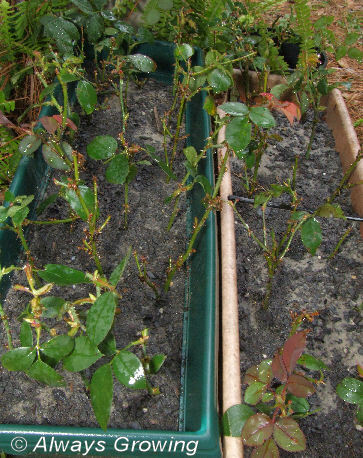 I selected several clippings and trimmed them back to about four to five inches, removed most of the leaves, dipped the cuttings in rooting hormone, and planted them in a large container. I have kept them damp, and if a freeze was predicted, I brought the container indoors, but mostly, they have stayed outside in a shady area. It wasn’t long before I started seeing tiny signs of leaves. Today, these cuttings, while they have lost their mature leaves, have started growing a lot of new ones. I haven’t lightly tugged on the cuttings to see how well they are rooting. I figure, it is too early, and it is better to leave well enough alone. 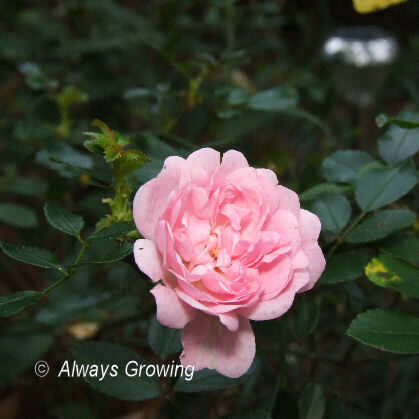 But, I do think that all this new growth is a promising sign that I just may be on the way to having a few more roses bushes for the garden – all for free. I still hesitate sometimes to wack things back, but I find that it is not so hard anymore, and it really helps keep certain plants in shape or allows them to bloom more. So, when Pam at Digging stated that she was trimming back her Mexican Bush Sage to make it more compact, I went to work on mine. After I trimmed them back, I decided to try and root some. 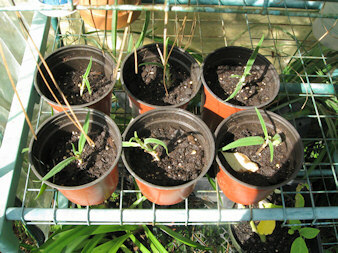 So, I took six small cuttings, and, so far, they are surviving. No wilting even in the hot temps we have been having lately. I am thinking about taking some cuttings from other fall blooming plants also. I definitely want to take cuttings of the wine sage since I only have one plant, and I want to ensure I always have plenty of that deep burgundy flowering sage. I also want to take cuttings of the regular pineapple sage and the “Golden Delicious” pineapple sage to have more of those, too. Sometimes, I try and propagate plants just to see if I can do it. I have had a great deal of luck with dipping the cuttings in rooting hormone, and then making sure that the cuttings stay moist. If I am successful with this propagation, I’ll have several free plants for my garden and some to give away. I thought that I would be able to plant up some seeds today, but it was just too cold. We are expecting another night of freezing temperatures. However, I did assemble the seeds and my seed starting mixture. Since it is supposed to warm up tomorrow, I hope to be able to plant everything then. About a month ago, when all the leaves had finally fallen off, I cut back a few small limbs of a Confederate Rose (Hibiscus mutabilis) that were blocking the sun from some understory plants. 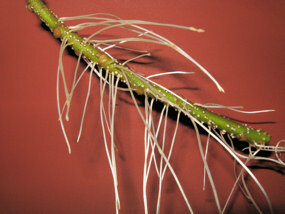 I took three cuttings about 10 to 12 inches long and put them in water to see if they would root. That is how my mom made the one I have. I did not really expect them to root because I figured the tree would be dormant, but I felt I had nothing to lose. I was pleasantly surprised to find after about two weeks there were white bumps on the stems. After another two weeks, there are enough roots to pot them up. I will have to keep them inside with all the cold weather, but come springtime, I should have three good plants ready to go in the garden. I don’t know what I’ll do with them. I will only need one, so I’ll probably offer the others to my daughter and sister. These plants grow fast. They may freeze back to the ground here when they are small, but after they get some growth on them, they usually do okay. 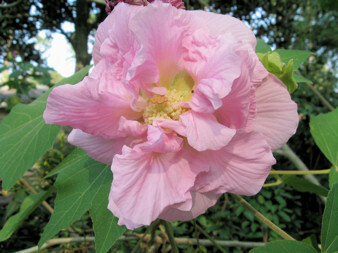 I really like the Confederate Rose because not only is it a beautiful tree when in bloom, but it blooms in the fall when few large plants are in flower. The tree was beautiful last fall when this picture was taken.